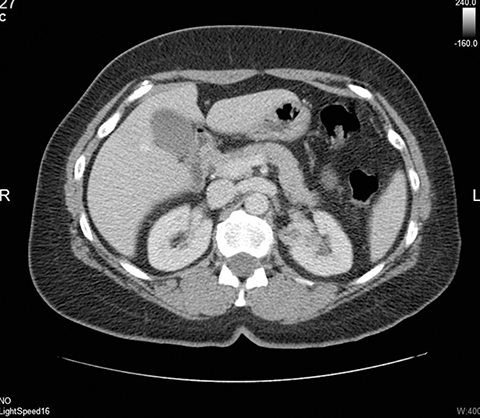 A 57-year-old Caucasian female presents with recurrent urinary tract infections and hematuria. She reports intermittent left flank and pelvic pain, which she has had for several months. Past medical history of hyperlipidemia and osteoarthritis. Past surgical history includes cystoscopy and hysterectomy. No family history of recurrent urinary tract infections or hematuria. Physical exam of the patient was non-contributory, and the only lab value of significance was a serum creatinine 0.6 mg/dL. 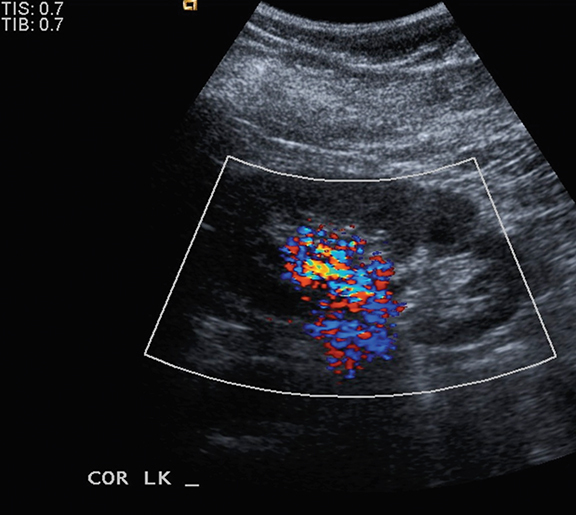 Ultrasound shows a left upper pole renal arteriovenous malformation, which measures approximately 2.6cm in diameter (Figure 1). 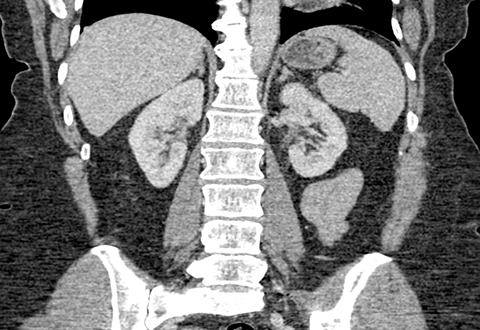 CT urogram shows a lobular mass within the left upper pole kidney, which was indeterminate but suspicious for vascular malformation (Figure 2). 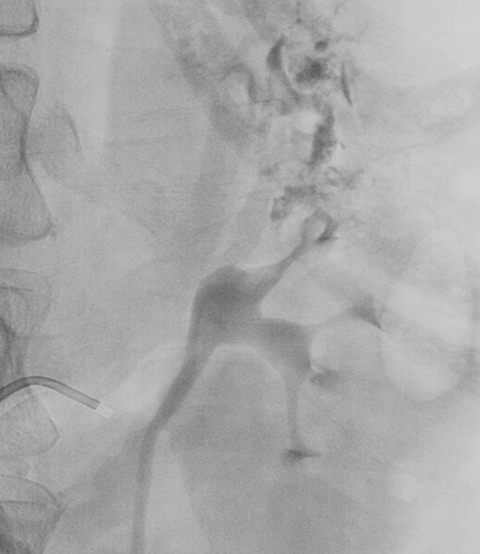 Left renal arteriogram shows a large cirsoid type renal arteriovenous malformation. This occupies the majority of the upper and central interpolar kidney (Figure 3). 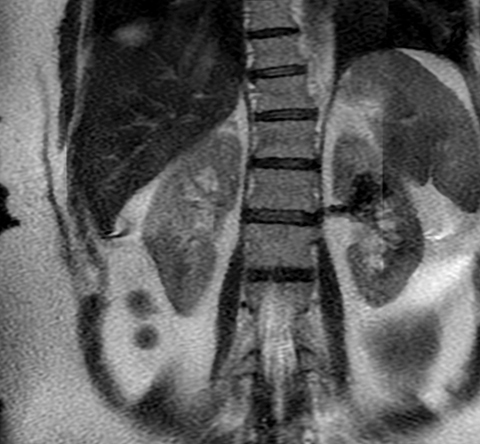 Coronal MRI shows a focal mass like area exhibiting characteristics of a flow void in the upper and central interpolar left kidney (Figure 4). 1. Crotty KL, Orihuela E, Warren MM. Recent advances in the diagnosis and treatment of renal arteriovenous malformations and fistulas. J Urol. 1993;150:1355–1359. Tarif N, Mitwali A, Samayer S, Abu-Aisha H, Memon N, Sulaimani F, Alam A, Al Wakeel J. Congenital renal arteriovenous malformation presenting as severe hypertension. Nephrol. Dial. Transplant. 2002;17(2):291-294. Cura M, Elmerhi F, Suri R, Bugnone A, Dalsaso T. Vascular malformations and arteriovenous fistulas of the kidney. Acta Radiol. 2010;51:144-149. Messing E, Kessler R, Kavaney PB. Renal arteriovenous fistulas. Urology. 1976;8:101–107. Muraoka N, Sakai T, Kimura H, et al. Rare causes of hematuria associated with various vascular diseases involving the upper urinary tract. Radiographics. 2008;28(3)855–867. Takebayashi S, Aida N, Matsui K. Arteriovenous malformations of the kidneys: diagnosis and follow-up with color Doppler sonography in six patients. AJR Am J Roentgenol. 1991;157:991–995. 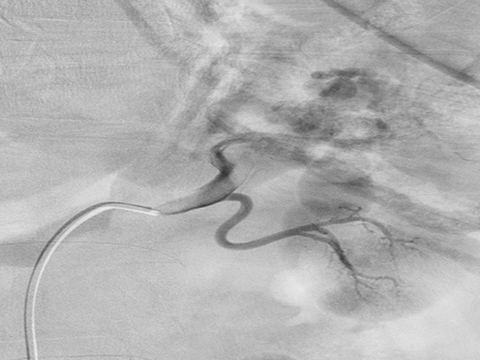 Takeuchi, N., Nomura Y. Ruptured renal arteriovenous malformation successfully treated by catheter embolization: a case report. BMC Res Notes. 2014;7(19). Chimpiri, A. Rao, and Balasubramani Natarajan. Renal vascular lesions: Diagnosis and endovascular management. Seminars in Interventional Radiology. 2009;26.3:253–261. PMC. Web. 13 Apr. 2015. Donnelly L., Adams D., Bisset G. Vascular malformations and hemangiomas: a practical approach in a multidisciplinary clinic. AJR Am J Roentgenol. 2000;174:597-608. Kenny D, Petruzzi N, Egizi T, Camp R. Cirsoid renal arteriovenous malformation. Appl Radiol. 2016;45(6):35-37. Prepared by Dr. Kenny while a Body-Imaging Radiologist and Dr. Petruzzi while an Interventional Radiologist, both affiliated with Atlantic Medical Imaging and AtlantiCare Regional Medical Center; and Mr. Egizi while a third-year medical student at Rowan School of Osteopathic Medicine in Stratford, NJ; and Mr. Camp while a fourth-year medical student at Saint George University Medical School in Grenada, West Indies.